Truck rollover accidents occur daily to drivers of small, large and semi & big trucks as well. Pickup truck rollover accidents occur more frequently than rollover accidents involving smaller passenger vehicles due in part to the higher center of gravity and the loads that these trucks often carry. In addition, pickup truck rollover tend to be more dangerous to the occupants than rollover accidents involving SUVs and smaller cars. According to the Insurance Institute for Highway Safety, about 45% of pickup truck-related fatalities were caused by rollover accidents, compared to 23% of car-related fatalities. Notorious for rollovers are the Ford’s highly popular Ranger F150, 250 and F350 pickup trucks and not far behind are the high numbers of Chevy Silverado, S-10 and Colorado pickups rolling over as well. While not as many the Toyota Tacoma, Nissan Titan and the Dam Ram trucks continue to hold their own in the rollover charts as well. When a truck rollover occurs, the trucks roof and roof pillars can fail and massive roof collapse and roof pillar crush can result. 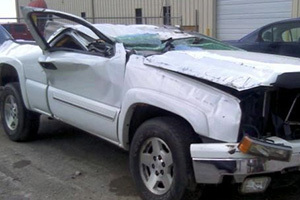 A pickup truck roof in a rollover drop test will often fail and the truck will crush down beyond the safe limit invading the occupants survival space. Semi truck drivers in cabs during a big truck rollover are often severely injured due to the fact that these cabs are often made of fiberglass and aluminum and have no internal rollover cage, roll bar or rollover protection. Sadly, with better engineering and safety principles used in the design of these all trucks, many of the death and serious injuries may be prevented. If you or a member of your family has been hurt in a rollover accident in which you believe the trucks defectively designed roof, roof pillar, seat belts or airbags played a role in their injuries, then call for a free case evaluation. A truck roof defect lawsuit can be filed in accidents in which the roof collapse killed or maimed your loved one. To learn more, contact a pickup truck rollover lawyer by contacting the Willis Law Firm at 800-883-9858. The injuries of many pickup truck rollovers are preventable. When negligent manufacturers allow these dangerous vehicles to be sold without properly designed roofs, seatbelts and airbags, we believe they should be held responsible. 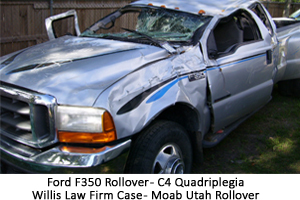 If you have been harmed in a rollover accident or roof crush, call us and talk to a pickup truck rollover lawyer. No one should have to live with the consequences of a truck rollover caused by another party’s negligence. The pickup truck rollover attorney at the Willis Law Firm work hard to help our clients pursue the full compensation they deserve. Contact us today at 800-883-9858 for more information on what we can do to help you.